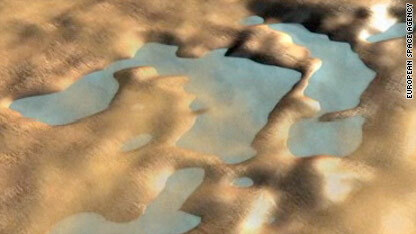 The European Space Agency says puddles and lakes of water like these likely existed during the early days on Mars. Conditions favorable to life may once have existed all over Mars, the European Space Agency said Friday. Maybe it is possible that a form much like human race once existed on Mars, perhaps 100 million years ago, then vanished. Maybe martians once had a very advanced technology and the nuclear war heads that were much more powerful and advanced than ours 100 million years ago, then destroyed themselves completely and the atmosphere. Are we from there? scientists can find water on mars, but can't find tupac or biggies killers? That's 100% proof the white man don't give a rats @ss about blacks! Must have been a disgusting pack of Republican's on Mar's also. Likely they either started a world wide holocaust or poisoned the water and water table to make a quick martian dollar before moving on like locusts. WHY ISN'T ROGER MARIS IN BASEBALL'S HALL OF FAME??? What about fishes, plants, animals and a race of little green people? MARS was once a sister planet to earth. pulled out of orbit by a meteor instantly causing it to lose its atmosphere and.. WATER. there are colonies deep inside mars as we speak. the TESLA COIL picked up martin transmissions.. ever notice the three "Mountains" on mars are identical to the Three pyramids in Egypt?? and on both Planets they line up perfect with orion's belt.. . think im crazy?? think im one of those nut jobs with a tinfoil hat ?? do some research and you'll find out..... ie- MONTAUK PROJECT, TESLA COIL.